I ended up sharing tablespace with Richard at Chicago Zine Fest, and now he's on a reading tour and coming through the Hudson Valley for us. Matt Whispers is also on tour with him. 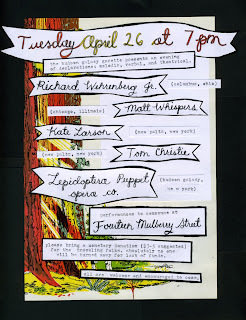 Tom Christie is a local/rad music-maker, and the Lepidoptera Puppet Opera Co. will be debuting their first performance, which (spoiler alert?) has a whole lot to do with pie. I've been working with a few friends to compose a musical soundtrack for the puppet performance to be performed live alongside of it. I've been spending time figuring out what to read that night: my instincts always say, "Just write something new, all right?" and the more exhausted parts of me just want to pull out something I've never read aloud, or something that hasn't really seen the light of day before (although there is sometimes a reason for this.) I'll figure it out by Tuesday. This is the first event I'm doing under the umbrella of "The Hudson Galaxy Gazette," which is an idea we'll be working with more in the coming months. Our hopes are that it will ultimately involve a monthly local calendar highlighting diverse events hosted by lots of different people involving art, music, reading&writing, d.i.y. choir practices, cook-offs, dancing, lecture series, potlucks, skillshares, learning&teaching, workshops, discussions, and activities of the funnest and most worthwhile sort. The list is kind of endless/we want it ALL. "Let's get together and do sweet stuff," basically. Look out for it in the near future! The Gremlins celebrated our friend Terrah's birthday party a few weeks ago with a show, and hopefully we'll be learning more songs and playing more shows soon. The Chicago and Rochester zine fests were both wonderful: the Chicago one being all sorts of good chaos (so many readings, zinester karaoke, 2 FULL COLUMBIA COLLEGE FLOORS OF TABLERS, space-themed after party, goodness gracious etc), and the Rochester one being comfortable and a bit more laid-back (full jukebox control is what dreams are made of). Our Rochester table was a true force to be reckoned with: Cheryl had so many lovingly crafted knitted items, I had piles of zines, and Nick had his new fresh-off-the-presses instructional zine on how to use a GameBoy to make 8-bit music. Cheryl and I also brought along some klessa cds and actually sold two! Wild. I ended up selling most everything I brought with me between the two fests, and I had brought quite a bit. 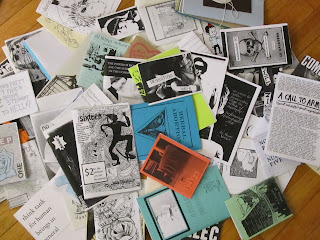 I also ended up hauling home so many zines of other peoples that I acquired, so the weight in my suitcase sort of evened itself out in the end. I got a lot of wonderful feedback about the games zine, so I'm glad it's already out there in the world and being used! And, of course, I've already thought of a few games I somehow neglected to include (as I KNEW would happen), so maybe a volume 2 will manifest someday. To put it out there, if you ever do want to know the complex instructions behind the game "Secret shots," just say the word. Now I'm sort of in an overwhelmed state where I don't want to make copies or collate or staple for a little bit. This has kept the new games zine from everyone's paws, and I'm sorry. I'll get back on the ball soon, I promise.